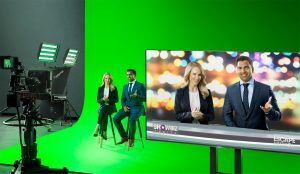 Blackmagic Design announced that The Motorsport Network, a multi-platform news network, has installed the first in a series of greenscreen television studios, built around Ultimatte 12 compositing processors, Ultimatte Smart Remote 4, and URSA Mini 4K. The network, which provides original news, highlights, and analysis for motorsports fans across the globe, needed a production hub that could not only deliver bespoke, original content for Motorsport TV, as well as its online and social media channels, but also act as a blueprint for further studios throughout its global outlets. Designed by JAM Creative Consultancy, the compact studio is housed within Motorsport Network’s offices, to allow easy access for journalists, experts, and engineers to participate in the various segments. “In order to achieve the look and feel of a large scale, professional broadcast studio within a very restrictive office environment, greenscreen, and virtual elements were essential elements in our studio blueprint,” explains Julian Okines, executive producer at JAM Creative Consultancy. The team chose Ultimatte for its superior keying quality and control to ensure program output was as authentic as possible and worked with integrator Broadcast & Production Services (UK) Ltd to implement the solution. Each of the three Ultimatte 12 processors are paired with an URSA Mini 4K, delivering a central wide shot, and left and right tight angles on the talent. Backdrops created by JAM’s in-house graphics team are combined with regularly updated b-roll of the Motorsport Network’s production office to give an insight into the busy newsroom environment, and played back on a series of HyperDeck Studio Pro broadcast decks. Ultimatte’s layering features are also used to enhance the foreground of the set. “We have additional lights in the studio, which can add spill, so we use additive blends in Ultimatte to blend the light seamlessly onto people’s skin as a flare in the foreground,” explains O’Leary. “Although VR backgrounds are now industry standard in television news production, we have been incredibly impressed at how Ultimatte 12’s technology has advanced to a point where the transition between the physical and virtual worlds is seamless,” concludes Okines.